Is that a joke? Yes, it is. 🙂 We’re participating in Give Big Pittsburgh, an event organized by the Pittsburgh Magazine and the Pittsburgh Foundation to raise money for local nonprofits through a single donation platform. 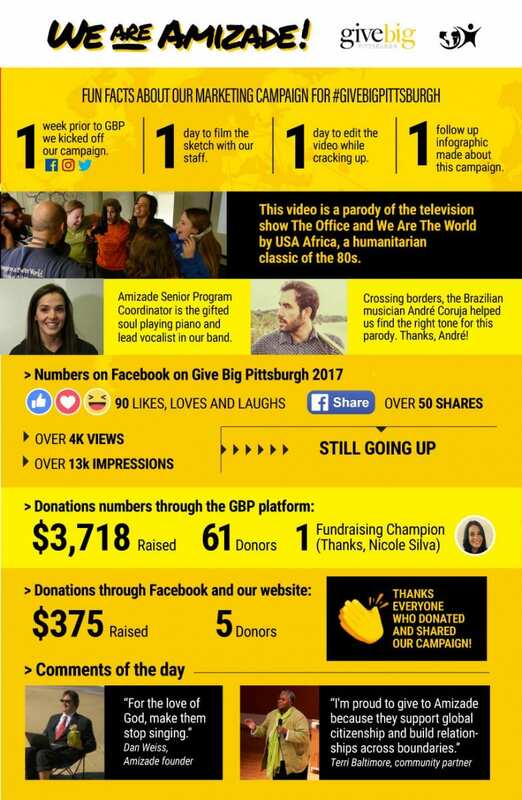 This year, we came up with a fun parody of the television show The Office and the song We Are the World by USA Africa to promote our organization in Pittsburgh and around the world. Watch the video! If you don’t want Amizade to become a singing group, let us know by donating on November 28th through GPB’s platform. If you missed the campaign, but still want to contribute to our organization, make a donation through our website. THANK YOU! Amizade’s creative and buzzing campaign during #GiveBigPittsburgh granted us the Facebook Frenzy Award, a prize determined by the Pittsburgh Magazine to add another $1,500 to our total of donations on that day. Without your support, we couldn’t have won it! Feel free to continue supporting our campaign through the end of the year to prevent Amizade from becoming a singing band and changing its mission. Here are some fun facts about our campaign on the last November 28th.